doug: The Suicide and Italian-American Reconciliation: win tickets! 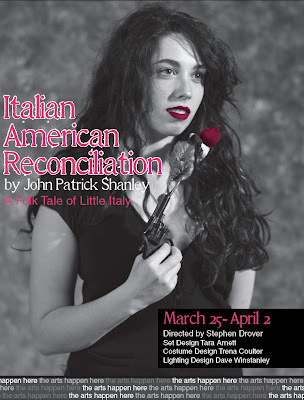 The Suicide and Italian-American Reconciliation: win tickets! Looking for some quality live theatre that fits into your budget? Check out the upcoming productions at Douglas College. With $10 student tickets and $7.50 matinees, they're tough to beat. Keep reading after the break to find out how to win free tickets. Semyon Semyonovich, an unemployed little man, wakes his wife so she will cook him a sausage. After she refuses, they fight, and he locks himself in the bathroom. Under the misassumption that her husband has become suicidal, she enlists the help of her mother and neighbors to save him. Semyon leaves the bathroom to set the record straight, but the damage is done. Word spreads about Semyon's desire for death. A series of characters come to pay Semyon a visit, all enlisting him to die for their cause or in their name. Swept up in his own importance and the idea of becoming a hero, Semyon eventually agrees to kill himself during a banquet held in his honor. At the party, however, Semyon faces the truth - he wants to live. He fakes his own death, only to accidentally come to life in the middle of his own funeral, at which point events spiral to a glorious climax. Read more about Director John Cooper. This sparkling, gritty romantic comedy is set against the backdrop of New York's Little Italy. Playwright John Patrick Shanley has won the Pulitzer Prize and the Academy and Tony Awards; his works include Doubt and Moonstruck. Huey Maximilian Bonfigliano has a problem: While he is safely divorced from his shrewish first wife, Janice, who shot his dog and even took a bead on him, he feels he cannot regain his "manhood" until he woos and wins her one more time - if only to put his broken marriage behind him once and for all. He enlists the aid of his lifelong buddy, Aldo Scalicki, a confirmed bachelor who tries, without apparent success, to convince Huey that he would be better off sticking with his new lady friend, Teresa, a usually placid young waitress whose indignation flares when she learns what Huey is up to. In a moonlit balcony scene (hilariously reminiscent of Cyrano de Bergerac) Aldo pleads his lovesick friend's case and, to his astonishment, Janice capitulates - although not for long. However we do learn that her earlier abuse of Huey was intended to make him "act like a man" which, at last, he does. And, more than that, he (and the audience) become aware that, in the final essence, "the greatest - and only - success is to be able to love" - a truth which emerges delightfully from the heartwarming, wonderfully antic and always imaginatively conceived action of the play. 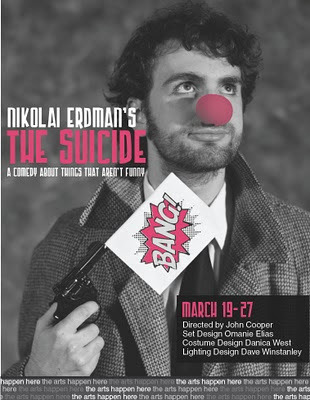 Want to check out one of Douglas College's upcoming productions - for free? We've giving away a pair of tickets for each show. Just comment on this post before 3 pm on Friday, March 19 to be entered into the draw. This contest is open to Douglas College students, staff, faculty and the public. Note: you must be able to pick up the tickets from the New Westminster campus between 8am - 5pm to be eligible.